It is 16 degrees below freezing and that even at this seasonably warm temperature, a little soup never goes unappreciated. 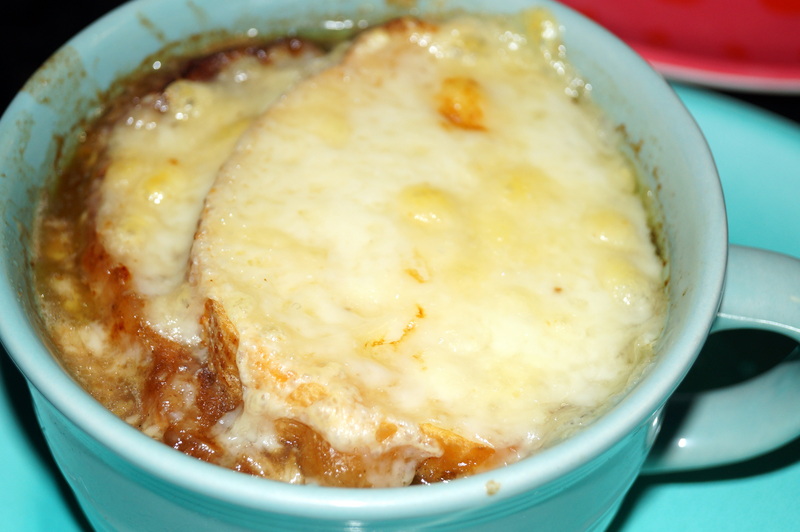 I don’t know what people have against French Onion soup, but this soup doesn’t get nearly enough love. It’s probably because nobody really knows how to carmelize onions properly. Most recipes online talk about slicing the onions thin and cooking over high heat stirring constantly for too long, or simmering for 4 hours over low heat. The real knack to this soup is that you have to plan in advance and set up a crock pot to caramelize the onions overnight or the morning before you make the soup. In this balmy 16 degree weather, a crock pot on low just doesn’t cut it. This is important, carmelize the onions on your porch, otherwise your entire house will smell like onions for a day. As pleasant as that sounds, too much of a good thing is not a good thing. I’ll take a stick of butter, 3 pounds of chopped onions, 1 clove of minced garlic, and a 2 tsp of thyme leaves, 2 tbsp of kosher salt and set it to caramelize overnight. Stir about 8 hour into it. If cooking the same day, cook on high and stir halfway through. After the real magic of time and crockpot has run its course, this becomes fairly routine. 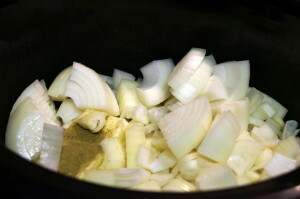 Pour the contents of the crock pot into a large stock pot and sprinkle 2 tbsp of flour over the onions. Don’t just dump in the flour into the onions or it will clump. Pour in 1 cup of a lighter red wine, like a bordeaux or pinot noir, add 2 bay leaves, 6 cups of beef broth, and, if needed, 2 cups of water. I will also add a bouillon cube or two for extra flavor. Bring to a boil and then reduce to a simmer for an hour, skimming the scum as it rises. While this is going on, get some french bread and cut into 1/4” slices and then toast. Grate some gruyere cheese. Serve by pouring the soup into a bowl, topping with toasted bread rounds and gruyere cheese. Melt the cheese under the broiler until brown spots form. I think that this recipe is awesome, it originally started as an attempt to clone the soup served at a restaurant in Disney’s Epcot, but became its own thing. In a crock pot, combine the onions, butter, salt, garlic, and thyme. Cook overnight or all day until onions are golden brown or dark brown (but not burnt). Pour onions into stock pot. Sprinkle with flour and stir in. Add wine, bay leaves, bouillon cubes, beef broth, and water as needed. 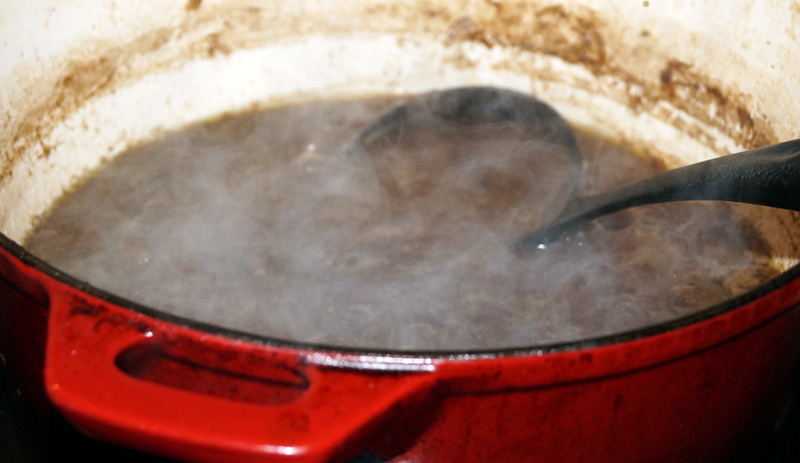 Bring to a boil over high heat and reduce to a simmer for an hour. Slice the french bread into 1/4” slices. Toast in a toaster. Pour bread into oven safe bowls and top with bred and grated gruyere. Melt the cheese under a broiler. Serve. This entry was posted in soup.